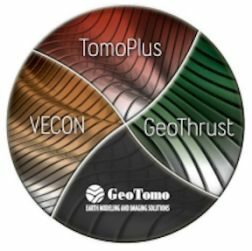 GeoThrust has been designed with a workflow architecture to obtain an accurate earth model and earth image in time and in depth from data recorded with irregular geometry in areas with rough topography, complex near-surface, and complex subsurface, with uncompromisingly high technical specifications for data analysis and quality control, but easy to learn and easy to use. 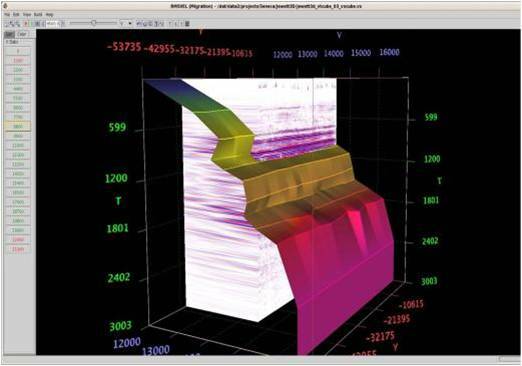 GeoTomo's GeoThrust 2D/3D seismic data processing software is now a mature system -- it has been in use by major oil companies, national oil companies, and service companies for more than twelve years. GeoThrust's workflow architecture provides the full freedom and flexibility for the user to follow any desired processing sequence. 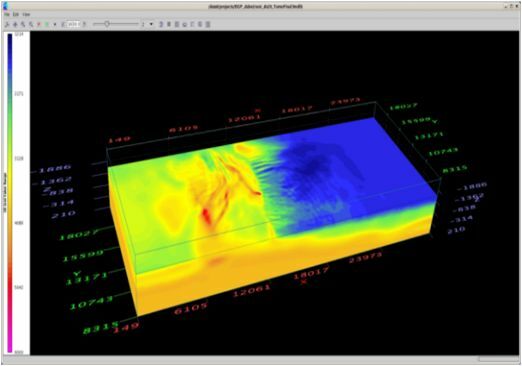 Additionally, to provide the GeoThrust user with streamlined solutions, we have constructed two uniquely image-based workflows --- the i-stats 2D/3D near-surface modeling and the i-cube 2D/3D subsurface imaging by using the various modules of GeoThrust. The i-stats workflow for near-surface modeling is superior to traveltime tomography and full-waveform inversion in many respects. It does not require first-break picking as for traveltime tomography, does not require source wavelet estimation as for waveform inversion, does not fail velocity inversions as in traveltime tomography, does not suffer from velocity-depth ambiguity, does not require data modeling (traveltime or wave field) as for any inversion method, and does not exhaust computational resources as in waveform and joint inversions. In contrast with tedious and time-consuming first-break picking and editing required by traveltime tomography, the i-stats method is based on event and semblance picking --- interpretively appealing to the practicing geophysicist. In contrast with the yet-to-be-resolved practical aspects of waveform inversion and joint inversion methods, the intuitively appealing image-based i-stats method is extremely robust and efficient for modeling of near-surface anomalies. The i-stats method is applicable to correcting for near-surface anomalies associated with sand dunes, shallow anhydrites and salt bodies, shallow basalt layer, karstic formation, glacial tills, and permafrost. In areas with complex near-surface with irregular topography and structurally complex subsurface, there is much uncertainty in rms velocity estimation for prestack time migration, whereas interval velocity estimation for prestack depth migration is despairingly challenging. We often attribute the velocity uncertainty to various factors, including strong lateral velocity variations, heterogeneity, anisotropy, and three-dimensional behavior of complex structures. Nevertheless, it is not easy to identify the cause of and account for the uncertainty as it often is a combination of the various factors. And the analyst struggles with much difficulty when estimating a velocity field whether it is for prestack time or depth migration. With the i-cube workflow, you circumvent the velocity uncertainty in imaging complex structures, you preserve reflection and diffraction amplitudes, you need not the tedious and time-consuming velocity updating for prestack time migration, and you obtain an improved image in time compared to prestack time migration. The i-cube workflow, applicable to both 2-D and 3-D seismic data, includes synthesis of a zero-offset wavefield to capture and preserve all reflections and diffractions, followed by zero-offset time migration. The near-surface model is estimated by nonlinear tomography applied to first-arrival times that accounts for topography, and resolves lateral and vertical velocity variations. Alternatively, the near-surface model can be estimated by the i-stats workflow with no need for first-break picking. Aside from statics corrections, the corrections for the near-surface are performed by wavefield datuming --- an essential requirement for imaging from irregular topography. GeoThrust performs subsurface velocity estimation, modeling and imaging from topography, not from a flat datum, based on rms and interval velocities estimated at reflector positions, not at reflection positions. The GeoThrust imaging in time and in depth are both performed by prestack Kirchhoff and wave-equation migration algorithms with uncompromising accuracy and fidelity. The system provides the analyst with powerful interactive tools to perform quality control of geometry and for appropriate specification of signal processing parameters, and image-based picking rms and interval velocities using four different strategies. The system manages optimum use of the cluster resources. GeoThrust is designed for Linux Workstation, and Linux Clusters. For an evaluation license, please contact us below.